ChetKennedy | My thoughts on faith, life and Ministry. Since I started Broken Mortals my Dad keeps asking me when I decided to write a book. So I started thinking back through my years as a reader and thought I would put some thoughts down. For those of you who have read my blog you know that my grade two teacher Miss Gleddie was the lady who inspired me to read by telling my parents to buy me comic books. That was the beginning of my desire to be a writer. I drew hundreds of comic books, I made sketches and drawings and storylines of hundreds of comics. Another significant moment of inspiration came when Miss Gleddie read to us from Mordecai Richler’s Jacob TuTu meets the Hooded Fang. I loved that book. She would read it to us during story time and it was the only book that I can truly remember being excited to hear. Somewhere in grade 5 or 6 I was introduced to Gordon Korman who wrote his first book when he was 12 years old. I wanted to be him. Yet writing a book seemed impossible when I was 12. In Junior High and Senior High I was absolutely obsessed with J.R.R Tolkien’s various writings, anything about the End Times and comics. Lots of comics. G.I.Joe, X-men, Spiderman, The Fantastic Four, I was obsessed with everything Marvel. I did attempt to write numerous stories back then but nothing ever amounted to anything. I often told myself if I ever write anything it will be how the End Times will actually happen because at 13 years old I figured that I knew everything about the book of Revelation. I was wrong I still could not write that book. Mr. Sheets was my English teacher in High School and he seemed to love my writing. Whether it was poems, or essays, or stories. Anything I turned in got excellent grades. Writing for me was effortless. In high school I was convinced that at some point in my life I would write a book. In Bible College writing became a chore and no longer easy, it was laborious and exhausting. There was so much reading and so much writing and that ruined the fun for me. When I got into youth ministry I built most of my own curriculum because in small town Saskatchewan it was hard to find cheap material. All the stuff from the big publishers was very American and militaristic. A lot of it seemed to focus on behaviours that Christians considered bad and not about simply following Jesus in a way that a student could grasp. So I began writing my own. That process is what starting me blogging because I realized that I had already built a ton of curriculum. I decided I might as well start capturing it on my blog. At some point in my youth ministry one of my Executive pastors informed me, “Quickstarts always say that they would like to write a book, but they never do because it takes too long.” It was after that conversation that I decided that I should really start compiling my writings into a book, just so I could prove him wrong. Unfortunately, that statement did prove true for many years after that because I was too busy at Beulah to actually sit down and bang out some chapters. It wasn’t until I quit that I had the time but… I was in shock, and heartbroken and struggling financially. So I didn’t write. Then, I happened to get introduced to a Podcast called “Don’t Keep Your Day job” by Cathy Heller. As I immersed myself in her message of “Get out there and do that thing that you keep putting off because the world needs you to do it” I started to believe that I could do it. Somehow, that podcast actually inspired me to take the book process seriously and I began the task of collecting my talks and building what would eventually be the skeleton for Broken Mortals. When did I decide to write a book? Probably the dream started in grade 2 in Miss Gleddie’s class. I’m now 44 years old and have finally achieved that dream. I am excited to announce that my book is in its final stages of development. I’ve always wanted to write this book. Once I started preaching I knew I needed to get this book out. I hoped that my perspective on biblical characters and stories would help people to understand the bible better. The Sunday school stories that we all know and love were not designed to give adults the full truths of scripture. They were designed to give children the elementary truths of the Christian faith. In Hebrews 5 Paul writes about the elementary truths of God as spiritual milk and the harder concepts of faith as spiritual meat. The Sunday school stories stop where they do because they were designed for children. Adults need to read behind the stories so that they can relate to the situations and the characters. When we relate to these characters we can see ourselves in the pages and realize that we are just as fallen. I believe that the bible is a historical book that is still extremely relevant for today. I believe that the stories captured in its pages are about real people who actually lived on the Earth at a specific time and place in history. If these stories are about real people then I believe these real people had emotions, and stress and life situations that created the conditions for the bible stories they are in. I tend to ask myself the question. If this happened to me how would I feel? That is the perspective I place onto the narrative. I look between the lines and behind the words to see if there is any more humanity that can be squeezed out of the story. Why? I believe when the humanity is shown in its beautiful tragic glory that is when God shines through. Isn’t God, not the human, or humans, the centre of all of these stories? I love the bible because it paints an accurate picture of the human condition. As human beings we make mistakes, we complain about many things, we do bad things on purpose. So do the people in the bible. The beauty of all of this is not the people in the stories but the God who is in these stories with them. The God who delivers and the God who saves us, the God who wants us to choose him. The point of these stories is not the people… it is Jesus. He is the ultimate point of all biblical stories, whether Old Testament or New Testament. Stay tuned for an announcement about when the book will be available. It has gone through 2 rounds of editing so far and is in the final stage of approvals. We are in the home stretch. I have been listening to comedy for years. I love comedians. I love how comedy disarms an audience and allows people to set aside their lives for a short while. I’ve used jokes or humorous stories in all of my sermons. In August of 2013 I attended a comedy show at a local comedy club. At the end of the night my friends and I were talking about how, I should try this. That night I went home and emailed every club in Edmonton. I asked for information on their open mic nights. I wanted to at least try it. The only club to reply was The Comedy Factory. Bob Angelli, the manager of the club told me to show up on September 12 at 8:30 pm and I could have my 5 minutes. Then the fear started… How would I do 5 minutes of StandUp? What if I’m not funny? I had a month to prepare, I wrote jokes, I tried jokes on people. I got generally over prepared and grew confident that I would have a good 5 minute set. Through a subsequent series of emails Bob informed me that he had actually placed me in an amateur Comedy competition called “So You Think You’re Funny.” Over the course of 5 weeks my set would be competing against 30 other comics. Suddenly, it was real. Ryan then went on to explain that they had all been doing amateur comedy for at least 3 years and some of them had been doing comedy for a lot longer than that. As it turns out the competition I entered is used by amateur comedians to jumpstart their professional comedy careers. I was definitely in the wrong place at the wrong time. Up go the nerves, up goes the anxiety and I started to tell myself it will be over soon, just do your set and go home. I hadn’t really planned on filming it. So my wife actually filmed part of it until her phone informed her that it was full. Luckily though friends of mine had also been filming with their phones. So… I managed to piece together the entire 5 minute set. In the end, I actually got laughs. I did my five minutes, as you can see, some jokes were great, some jokes not so great. I still have such high hopes for that jetpack joke. When it came time to announce the 3 comedians who would be moving in to the semi finals of the competition they announced 3 of my competitors and then they also said my name. They had decided to send me on to the semis because they thought they saw something in me and would like to see more. Winning is fun, but practice and preparation are not really my thing. Now that I was moving on to the semi finals, and I actually found the whole stand up experience fun, I wanted to do better for the next night. I wrote more jokes. What I mean by that is I actually sat down and wrote out the entire joke. The setup and the punchlines for all my jokes. Why? Because Bob told me to hone my 5 minutes. He told me it needed to be memorized so that it looks spontaneous. So that’s exactly what I did. I then showed up on Saturday nights for the late show at the Comedy Factory and did my new material. It’s important to try jokes out in front of a real audience. Some of the jokes that I thought were definitely keepers actually turned out to be duds. Even more surprising was that some of the jokes that I liked, but wasn’t really sure about got laughs and even clapping. When you get applause at a comedy show it’s very, very good. A month later, I find myself back at the Comedy Factory. 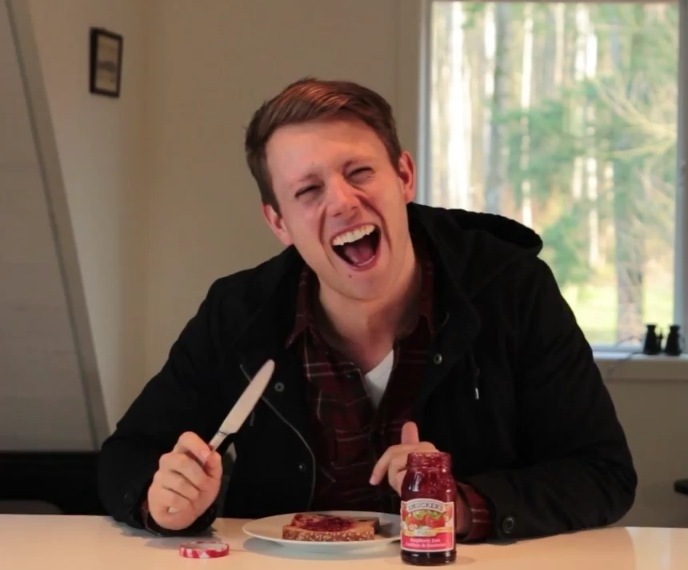 I have more jokes and I am more prepared. I am less stressed and more confident. I honestly believe that this is my last show because I am fairly certain I won’t win the semi-finals and go on so I figure I will go out with a bang. At the end of the night, when Bob Angelli declares the winners, he announces my name first. Suddenly I find myself in the Finals. The competitive part of me is pumped, but the rest of me is tired… Tired of writing jokes, tired of being stressed about the competition, tired of the whole thing. I was ready to be done, but I was not done. Back I went to writing jokes, to pulling out jokes that didn’t work, throwing in new ones that might work. Back to the late shows at the Comedy Factory to test out my material. Writing 5 minutes of comedy is, in my opinion, harder then anything I’ve ever done. I can write sermons, songs, seminars… nothing is as difficult as coming up with 5 solid minutes of engaging, funny material. A month after the Semi finals I find myself back at the Comedy Factory. Lots of familiar comedians now. Honestly, I’m not looking to win, I’m just hoping to be worthy of the competition. If these are Edmonton’s best amateur comics then I really have no business being on the same stage as they are. Ultimately, I didn’t win, but I did get to the final 6 out of 30 comedians. According to Bob Angelli I did very well. He says I have great stage presence and good delivery. I need to work on my timing, and… I need to work on my pauses. One more thing that I learned… Every comedian in the finals, except for me, brought their best jokes. Every one of them did the same routine for each round of the competition. They have a 5 minute routine that they have crafted over the years and they use that one to compete with. Writing new jokes is important for comedy but delivery is KING, when you are in a comedy competition use your best material every time. I was asked this weekend by one of our students if I was still his youth pastor. That question kind of stung me because I didn’t realize that my new job title might be confusing for some of our students so I thought I should take a moment to try to clarify my new position here at Beulah. I am officially the Next Gen Team Leader. This new position was created to bring Children, youth and Young adult ministries together. Ultimately, the point of Next Gen is to build bridges. As we look at the trends present in churches across North America there are clearly some places where our churches are suffering when it comes to bridges from one age based ministry to the next. One of the places we definitely need to build a bridge is between Youth Ministry and Young adults ministry. According to a Canadian study called Hemorrhaging Faith, “only one in three young people, who attended church as children, still do so today.” Books like Goodbye Generation are pointing to a drop off between Grade 12 and University age students. Clearly, we need a bridge. The Next Gen team is working on that bridge by building a more focused Young Adults ministry. We limited the span of Young Adults ministry from 18-24 years of age. This way we can target our message and ministry to a very specific age group. Furthermore, we are building a program that has easy entry points and a weekly ministry so that students can join at any time in the year. As we move forward we will also look for ways to allow grade 11 and 12 students to join the young adults ministry periodically so that when it comes time to make the transition there will not be any hesitation because of a lack of knowledge or familiarity with the program. Another disturbing quote from Hemorrhaging faith says that, “More young people leave the church between childhood and adolescence than between adolescence and young adult years.” This means more and more students are leaving the church before they even step into our youth ministry. There are probably a number of factors involved in this process but as the Next Gen Team analyzes this situation we are considering some new strategies for the future of Beulah. One thing we have seen is that our older elementary kids “feel” too old for our elementary programming but are clearly not ready to participate fully in our weekend services. Going forward we will be building a more targeted older elementary program for our grades 4 – 6 students. We are also building a specific grade 6 track that allows our students to have both feet in children’s ministry while testing the waters of our Jr Hi youth ministry periodically throughout the year. The Next Gen Team is all about building bridges. Back to the original question, Yes, I am still a youth pastor here at Beulah Alliance Church and we will still be building a strong youth ministry with Denise Lang, Shari Letts and our incredible staff of volunteer leaders who truly make this ministry what it is today. 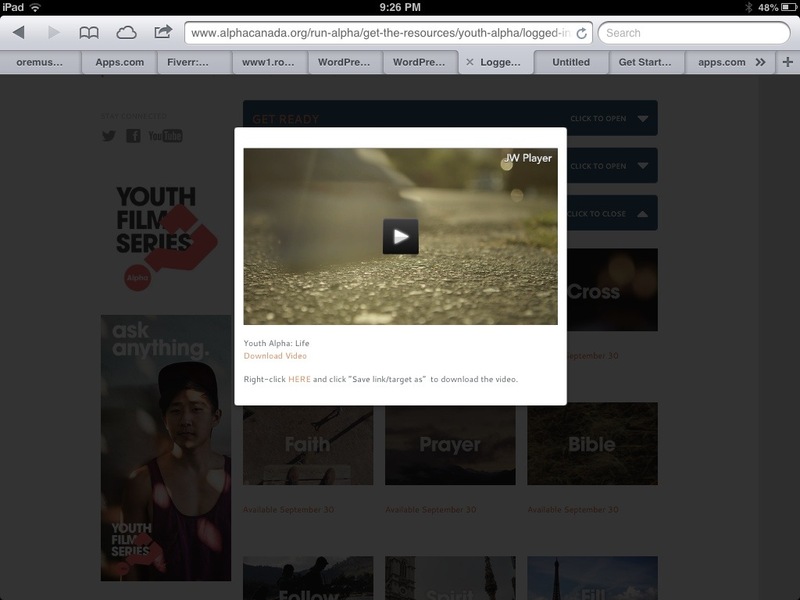 The first two episodes of the Youth Alpha film series are available for your viewing and download. I just spent the last hour wandering through the site and previewing the material and I am very excited to introduce our students to this new format for alpha. For those of you who are not sure how to access these videos the process is simple. You start by going to www.alphacanada.org. Once you are there you will need to click on the Alpha for Youth tab. Once you are there you will need to click on the orange button that says register a course. Click that and you are done. Now, check your email. Alpha Canada will send you your login info and password. 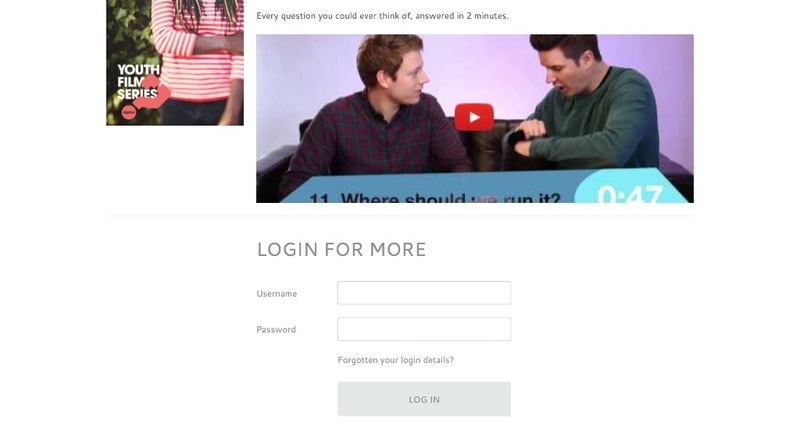 Use those to login again to the Youth Alpha website. Once you are in you will see four blue bars… Get ready, get trained, get the talks and get promoting. Click on Get the Talks. The bars will move apart revealing a series of 12 thumbnails. One for each episode of the series. At this point only the Life and Jesus episodes are available. Click an episode and it will bring up a video player. You can play the movie in the viewer, full screen or you can download the video to your hard drive for viewing later. 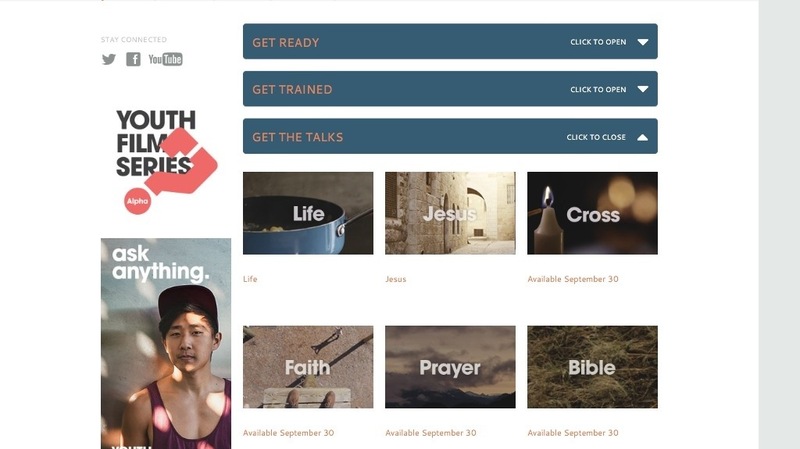 I hope this short tutorial helps you to get access to the new Youth Alpha Film Series videos and I pray that God blesses your ministry as you use this incredible resource in your church and student ministries. How we are using the Youth Alpha Film Series in our Youth Ministry. Some of you may be wondering about our Youth Alpha film series rollout this Fall. If you have been watching my instagram (http://instagram.com/ch3tk) or facebook (https://www.facebook.com/Ch3tk) posts you will see that I am pretty excited about Alpha and especially the Youth Alpha film series (http://www.alphacanada.org/blog-2/film-series/) which is launching this fall. Some of you will remember that we brought Jason Ballard in to speak at our Vicissitude fall retreat last year. At the time he was just starting to work on this whole epic project. I’m convinced that as we partner with Jason, Ben and the Youth Alpha Film series that God will bless this ministry in many ways. 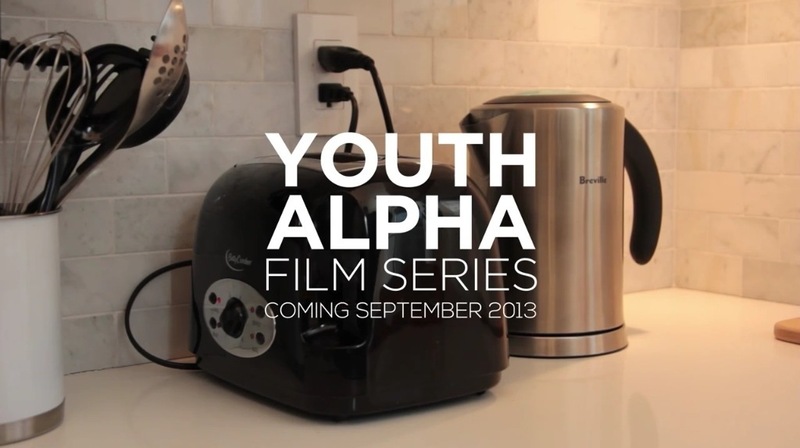 Our curriculum this fall will be the Youth Alpha Film series. (http://www.youtube.com/watch?v=FfHgJSxtIzo) My original idea was to go much smaller, to use the film in our restaurant alpha or as a part of our school prayer groups, but, when I spoke to Ben and Jason at the Alpha Conference earlier this year God began to change my plans. Personally, I think the best part was when I rolled out this fantastic idea to Denise and some of our other leaders, they told me that they had already thought about that and were just waiting for me to come around to the idea. LOL. It is our goal to expose as many of our students and leaders as possible to the Youth Alpha Film series this fall. Easiest way to do that is to simply use the series like we would our regular curriculum. So… we will be rolling it out from September through to November, in Resonate Jr, in our Gravitate houses and through our Illuminate nights. It’s going to be bigger than anything we have ever done before. That means we will have over 200 students participating in an Alpha course this fall. But… It gets better. We want to run Youth Alpha in schools, in Coffee shops, in an A&W and in as many other restaurants as possible. We want students to run Youth Alpha in their own homes, or in their back yards. It’s going to be an epic rollout that will be monumental in its scope. We would like to start 20 Alpha groups through this process. After the groups have run their course we will evaluate them, tweak them and find more ways to run Youth Alpha in the next year. Bottom line: We are running Youth Alpha this year and we want you to bring your non-churched friends to come check it out. The best is yet to come.